Herpes of the eye, or ocular herpes, is a recurring viral infection that’s usually caused by the herpes simplex virus-1 (HSV-1). This is the same virus that causes cold sores. Ocular herpes can also be caused by herpes simplex virus-2, which is the main cause of genital herpes. Ocular herpes can produce sores on the eyelid or surface of the cornea. Recurrences can lead to complications like blindness or meningoencephalitis, a lethal infection of the brain. There’s no cure for ocular herpes, but it can be controlled with antiviral drugs. 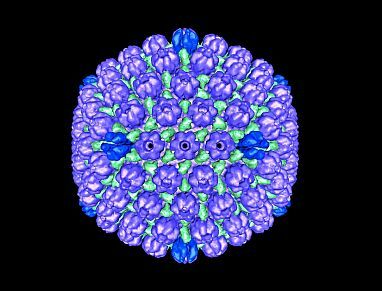 The main class of antiviral drugs used to treat ocular herpes blocks the virus’ ability to replicate (make copies of itself). The drugs are nucleoside analogs, which look similar to DNA nucleotides but have a modification that interferes with DNA replication. Some people have viruses that develop resistance to these antivirals and would benefit from other types of treatments. A team led by Dr. Deepak Shukla of the University of Illinois at Chicago investigated the antiviral properties of a molecule called BX795 in cell lines and mouse models of ocular herpes. The research was supported by NIH’s National Eye Institute (NEI). Results were published in Science Translational Medicine on February 14, 2018. The researchers were initially testing BX795 in cells infected with HSV-1 to better understand aspects of the host cells’ defense system. BX795 is known to block a molecule called TANK-binding kinase 1 (TBK1), which cells produce to protect themselves after an infection. The scientists expected that blocking this molecule would increase the amount of virus in the cell. They were surprised to find that the drug reduced herpes infections. Affordable at-home testing for Herpes. Fast, simple, confidential. Order now!